Eventually the gang comes across a Satanic church where some evil monks give them drugged bread and wine. The head monk then sacrifices a cat and says some mumbo jumbo which causes Helen to dance naked with a snake, resulting in a great scene that positively exudes sleaze, cartoon Satanism, and psychedelic hysteria. 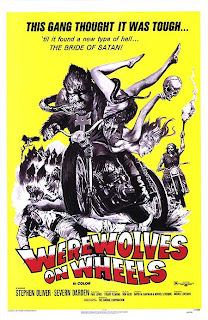 The gang eventually wakes up, trashes the ceremony, and hightails it out of there, but not before the power of Beelzebub has turned at least one of their number into a werewolf that knows no gang loyalty when in the throes of lycanthropic bloodlust. 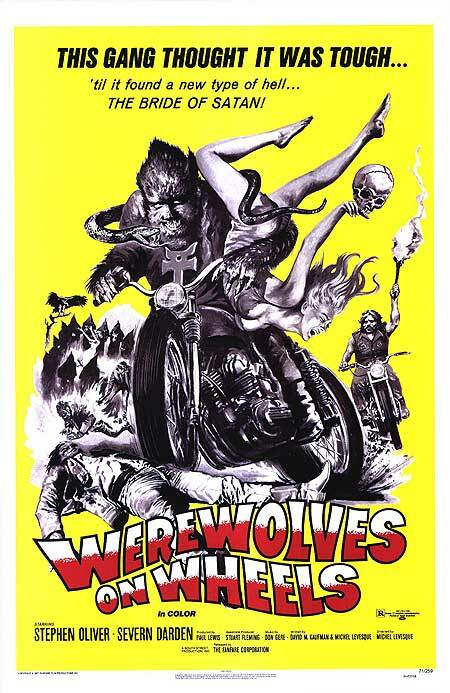 By the standards of early seventies drive-in movies, WEREWOLVES ON WHEELS is well made, with mostly excellent cinematography, a fairly coherent screenplay, and solid acting. More importantly, you’ve got bikers beating up rednecks, chanting Devil worshippers, cat-blood drinking, naked snake dancing, werewolf attacks, and people getting set on fire. As a special bonus you also get Barry “Eve of Destruction” McGuire in a supporting role. And yes, the movie does live up to its name, although not until it’s almost over and not very well. By modern standards it can be a little slow moving at times, but I kind of like the laid back pace and extended shots of bikers riding down the highway while the cool instrumental fuzz rock soundtrack plays on. They just don't make 'em like this anymore.